It’s no easy feat to cultivate a high-trust, high-performance organisation. According to Great Place to Work, it takes the commitment of dedicated and motivated employees and leaders to achieve such a lofty goal. We’re proud to announce that Great Place to Work has named Kantar Worldpanel, as one of the ‘Best Companies to Work For® in Greater China’. More than 217,000 of employees from 145 of companies across the region participated in the survey. Only some of them will be recognised as one of the Best Companies to Work For® in Greater China. The survey assessed employees’ perspectives on leadership, organisational culture, and trust. 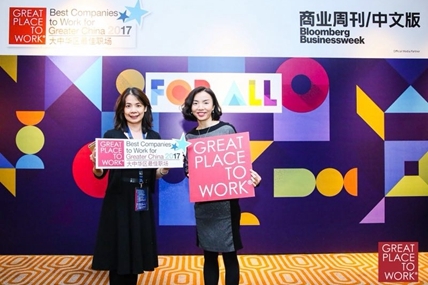 Great Place to Work’s Best Companies to Work For® in Greater China List create cultures that are friendly, inclusive, productive and ethical. An overwhelming majority of employees at the Region’s Best say they’re proud of their workplaces. Since 2012, Great Place to Work® has identified the top organisations that create great workplaces in Greater China in which they operate through the publication of the Best Companies to Work For in Greater China List. The objective of publishing the list is to acknowledge organisations and Great Workplaces from diverse industries and sizes that deliver and establish great culture among the colleagues and associates, so as to sustain and enhance the competitive edge of the region. To be considered eligible for the Best Companies to Work For in Greater China List, companies must score at least 70% in the overall result of the Trust Index© employee survey and Culture Audit© assessment. Great Place to Work®, headquartered in San Francisco, is the global authority on high-trust, high-performance workplace cultures that provides executive advisory and culture consulting services to businesses, non-profits, and government agencies in 57 countries across five continents. Through proprietary assessment tools, benchmarks, advisory services, workplace reviews and certification programs (such as the Fortune's 100 Best Companies to Work For published on Fortune Magazine), Great Place to Work helps its clients create great workplaces that outpace peers on key business metrics like revenue growth, profitability, retention and stock performance.